Prodigy H/T tires are built by Yokohama as a lower cost option for car owners on a budget, yet want a tire that delivers solid all-season performance and an excellent treadlife. Although Prodigy is not a name you may recognize, you can be assured that as a member of the Yokohama family, this tire is well made and built to perform. The tire itself features an all-season tread design that handles well on both dry or wet pavement. Added sipes and circumferential grooves help evacuate water from under the tire and reduce the risk of hydroplaning, as well as provide added traction in the snow or slush. A variable pitch tread design also reduces road noise and makes it quiet behind the wheel. On the inside you will find twin steel belts with a jointless nylon cap which work to give added contact with the road and more strength and stability at higher speeds on the highway. It is also what gives the tire a much smoother and comfortable ride. Overall, this is a nice choice in all-season tires for the budget minded driver who wants performance in year round weather conditions and a long lasting tread as well. Prices on the Prodigy H/T range from around $88 for the 15 inch series tire to approximately $119 for the larger 17 inch series tire. Who Are Prodigy HT Tires Designed For? 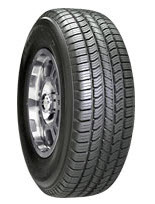 The Prodigy HT tire is designed for use on all types of coupes, sedans, minivans and other vehicles for drivers who seek an all-season performing tire that handles well in all weather conditions and provides a smooth, comfortable ride at a budget friendly price. The Prodigy HT tire comes with a 40,000 mile treadlife warranty. Tire uniformity is backed for the first 2/32 inch of treadwear. Materials and workmanship are backed for 5 years.